Allen's winning First Place Design! Allen went to Alaska last summer. He loves timber sports and competes professionally (along with his dad Jeff and brother Warren). 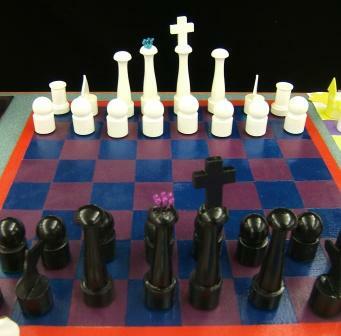 The white pieces represent the Spruce Mill in America and the black pieces are Dawson Creek in Canada. These two mills are very competitive and Allen thought it would be a great choice for a chess set. The rooks are forts from an art set they had at home. 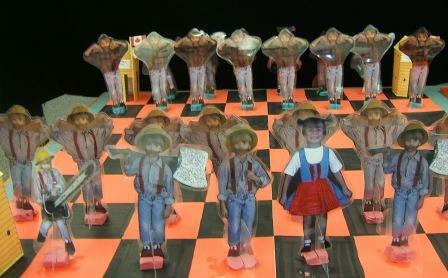 Allen and his mom spent several days taking photos of him as the chess pieces. His dad let him use a real chain saw as the knight. He held a hatchet to represent the bishops. His mom happened to have a dress, (even though Allen only has an older brother, his mom, Melody, said she always wanted a little girl and keeps the dress around just in case) so... he used it to dress up as a queen! Allen put the names of the pieces on the back so players would know what piece they were moving. 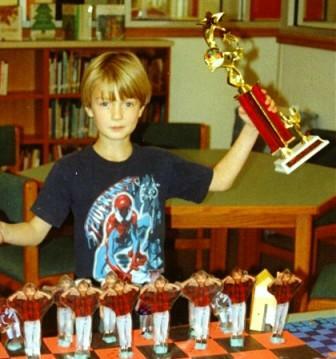 Allen and his mom laminated the pieces so they would hold up while playing. Carmen's dad suggested making a wooden set. He did the work that required cutting. She painted and glued the pieces together. The knight design was her idea, as well as the queens crown. Carmen designed and painted the board. The judges thought the craftsmanship of the set was excllent and the painting was very professional looking! Rachel's Clean Lines... hand carved soap! Rachel carved this set out of soap all by herself! The design and colors were all her own. She said it took a couple of days to do it all. The judges loved the idea and everyone was talking about marketing the idea. Oregon would have the cleanest chess players in the nation! Malexa and her mom were shopping at a local craft store and found the marshmallow style pieces. While her dad helped with the idea concept, she said he pretty much slept through the assembly process. 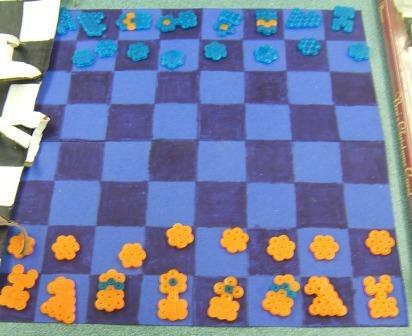 Malexa chose the colors and designed the board. She said it took several hours to put everything together. 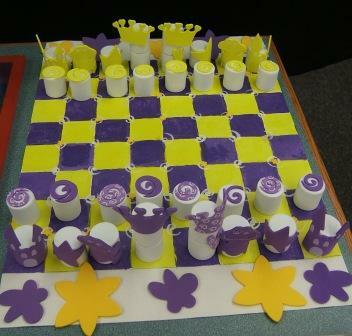 The judges thought the design was very innovative and loved the use of frogs as the knights! Zia designed a cardboard set. She used materials they had on hand... a large cardboard box! 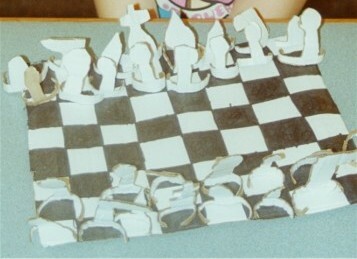 She designed the chess set herself and cut the intricate design out of the cardboard, which took a long time! She drew the details of the pieces with a marker. She calls her set 'The Diaphanous Chess Set". The judges thought the set was very creative and Zia's solution for helping the pieces stand on their own was ingenious! Lukas had used the hot dots before for other projects. 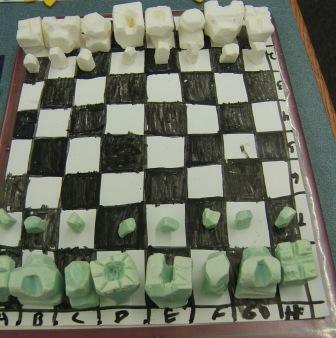 When the chess set design contest came around he knew just what to do! His mom helped a little with the knight design and his dad helped him draw out the board. But Lukas colored it and ironed all of the pieces together. He said it took him about four days to complete. The judges thought this was one hot design!